Fractional flow reserve (FFR) measurements can determine the haemodynamic relevance of coronary artery stenoses. Current guidelines recommend their use in lesions in the absence of non-invasive proof of ischaemia. The prognostic impact of FFR has been evaluated in randomised trials, and it has been shown that revascularisation can be safely deferred if FFR is >0.80, while revascularisation of stenoses with FFR values ≤0.80 results in significantly lower event rates compared to medical treatment. Left main stenoses, aorto-ostial lesions, as well as patients with left ventricular hypertrophy and severely-impaired ejection fraction, have been excluded from large, randomised trials. While FFR measurements are relatively straightforward to perform, uncertainty about procedural logistics, as well as data acquisition and interpretation in specific situations, could explain why they are not widely used in clinical practice. We summarise the clinical data in support of FFR measurements, and provide recommendations for performing and interpreting the procedure. Helge Möllmann (speaker and proctor honoraria, St Jude Medical), Gert Richardt (speaker honoraria, St Jude Medical), Johannes Rieber (speaker honoraria, St Jude Medical and Volcano Corp) and Thomas Schmitz (proctor honoraria, St Jude Medical). The other authors have no conflicts of interest to declare. The invasive measurement of fractional flow reserve (FFR) can determine the haemodynamic relevance of coronary artery stenoses. Determination of FFR is recommended in coronary artery stenoses with a luminal diameter narrowing between 50 % and 90 % if no non-invasive proof of ischaemia is available.1 To measure the FFR of a given coronary lesion, a wire or a microcatheter equipped with a miniaturised pressure sensor is inserted into the coronary artery. Under conditions of maximum hyperaemia, the relationship between the mean blood pressure distal to the stenosis (pd) and mean pressure in the aorta (pa) is determined. Generally, FFR values ≤0.80 are ance and associated prognostic relevance of the respective stenosis. Based on the results of several randomised, prospective clinical studies, in which the decision to perform revascularisation was based on FFR, the method carries high clinical relevance. 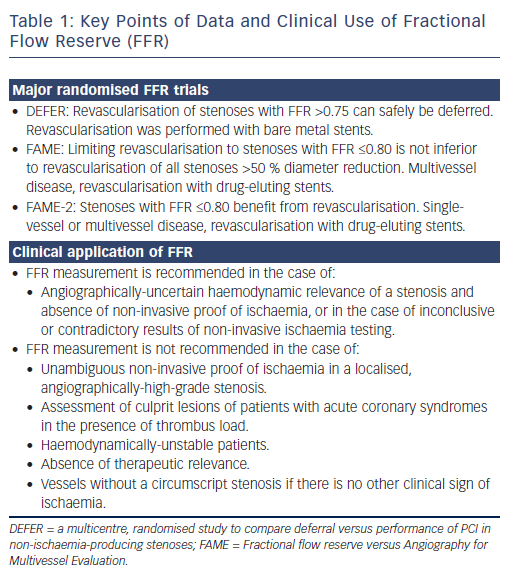 In the absence of non-invasive proof of ischaemia, FFR performed in stenoses with a 50–90 % diameter reduction was given a “class I recommendation” and “level of evidence A” in the guidelines for coronary revascularisation published by the European Society of Cardiology in 2014.2 The latest update of the American College of Cardiology/American Heart Association Guideline for the Diagnosis and Management of Patients with Stable Ischemic Heart Disease states: “It has been suggested in several studies that a PCI (percutaneous coronary intervention) strategy guided by FFR may be superior to a strategy guided by angiography alone”.3 One large clinical registry demonstrated that performing FFR changed further management in 43 % of patients compared to the purely visual assessment of coronary artery stenoses by invasive angiography.4 Even when non-invasive proof of ischaemia is available, FFR measurements often change clinical judgement regarding the need to revascularise a given coronary artery stenosis.5 However, despite clear evidence and guidance, many interventional cardiologists continue to rely on the visual assessment of stenosis severity alone, rather than performing FFR.6 Potential reasons include the logistical effort of performing FFR, concerns regarding potential complications and uncertainty about optimal performance and interpretation of FFR measurements, particularly in complex situations, such as multivessel disease, left main stenoses, serial stenoses or in patients with aortocoronary bypass grafts. In addition, while performing FFR is not technically difficult per se, several relevant procedural aspects have to be taken into account in order to avoid incorrect measurements or misinterpretation of results. For this reason, the present study provides a summary of consensus recommendations regarding the indication, performance and interpretation of FFR measurements. Clear evidence from randomised studies is not available for all patient groups and clinical situations. Therefore, this expert consensus is based on the most pertinent literature and the authors’ personal experience with the procedure. Particular emphasis is placed on the practical performance of FFR measurements, along with tips and tricks for everyday clinical practice. Revascularisation guided by FFR in patients with coronary artery disease and stenoses >50 % leads to better outcomes than revascularisation based on a visual analysis of angiographic stenosis severity alone. This is the conclusion of three large, randomised trials: the DEFER (a multicentre, randomised study to compare deferral versus performance of PCI in non-ischaemia-producing stenoses) trial, the Fractional flow reserve versus Angiography for Multivessel Evaluation (FAME) trial and the FAME-2 trial (Figure 1), including long-term follow up of patients initially included in these studies. Therefore, the DEFER and FAME trials demonstrated that, in patients with stable coronary artery disease, the conservative management of stenoses that could be angiographically severe, but are not haemodynamically relevant, is safe. The DEFER trial used a threshold of 0.75 to define haemodynamic relevance by FFR, but it mainly included patients with single-vessel disease, and bare metal stents were used for revascularisation (so that positive effects of revascularisation were less likely than with modern devices or in more severe disease). Patients randomised in the FAME trial had multivessel disease, PCI was performed with drug-eluting stents and the threshold value used for FFR was 0.80. The FAME-2 trial, in turn, demonstrated that patients with pathological FFR values (≤0.80) benefit from revascularisation with drug-eluting stents. Even though the risk associated with measuring FFR is low, FFR measurement of a given stenosis should only be considered if revascularisation of that lesion with PCI or bypass surgery is possible in case of a positive result. Current guidelines recommend the use of FFR to determine the haemodynamic relevance of stenoses with an angiographic diameter reduction between 50 % and 90 %, for which no non-invasive proof of ischaemia exists.2 There could be indeterminate or contradictory findings of non-invasive ischaemia testing that can be clarified or resolved by the invasive measurement of FFR. If FFR demonstrates the absence of haemodynamic relevance, the risk of future events associated with a stenosis is low, and cannot be further reduced by PCI with modern stents. FFR measurements are of particular relevance in patients with multivessel disease. The anatomical and functional severity of individual lesions in such patients varies widely. The DEFER and FAME trials, as well as numerous other prospective investigations, showed that the FFR-guided revascularisation only of haemodynamically-relevant lesions is superior to the angiographicallyguided revascularisation of all lesions that appear as “severe” or “relevant” luminal stenoses (Table 1). To ensure that FFR can be performed within the context of any diagnostic angiogram if the need arises, it is recommendable to routinely include informed consent for FFR measurements into the consent procedure for every diagnostic angiogram or coronary intervention. Patients should be informed about potential discomfort (shortness of breath, angina, palpitations, sensation of heat, diaphoresis), as well as potential risks of the procedure (coronary injury caused by the guiding catheter or intracoronary wire, as well as side-effects of medication used to induce hyperaemia). If intravenous application of medication to induce hyperaemia is planned, the patient should have a large venous access (either a sheath in the femoral vein or a venous cannula not further distally than the cubital vein). A more peripheral location could be acceptable if regadenoson is used. Sufficient flow via the venous access (e.g. by using parallel saline infusion) should be ensured in order to achieve rapid onset of medication. Because foreign material is being introduced into the coronary artery, we recommend anticoagulation and antithrombotic medication in the same way as for PCI when FFR measurements are performed. Because patients typically do not interrupt their regular medication for invasive coronary angiography, and in many centres fasting is no longer required for invasive coronary procedures, the influence of drugs and nutrition on FFR measurements is a relevant issue. According to Ozdemir et al., beta blockers do not influence FFR measurement results, and therefore, do not need to be interrupted.18 The situation regarding caffeine is less clear. While caffeine and adenosine have antagonistic effects on A2a receptors, which could influence FFR results with adenosine-mediated hyperaemia, the majority of clinical studies, even including intravenous caffeine (4 mg/kg, corresponding to 3–4 cups of coffee), failed to demonstrate any significant effect.19 Therefore, the overall influence of caffeine appears to be minimal, especially when consumed in small amounts and >1 hour prior to FFR measurements.20,21 In case of doubt, alternative drugs to adenosine (e.g. papaverine) could be used. Theophylline should be interrupted at least 12 hours prior to FFR measurements. Transfemoral and transradial catheterisation are equally suited for FFR. For patient safety, the use of diagnostic catheters is not recommended. They should be exchanged for guide catheters (at least 5F) for FFR measurements, as coronary dissection by FFR wire is a theoretical possibility that would require immediate intervention. Catheters should not have side holes, as they could impair intracoronary adenosine administration. In addition, they could influence pressure calibration and equalisation due to local turbulences at the catheter tip. The catheter shape should be carefully chosen for coaxial alignment at the coronary ostium. The catheter must not obstruct a narrow ostium or proximal stenosis (“wedge pressure”), as incorrectly low values could be measured for both pa and pd, which in turn would generate inaccurate FFR results. If in doubt, the catheter should be completely disengaged from the ostium for pressure calibration, equalisation and recording of pd/pa. As a first step, zeroing of the aortic pressure must be ascertained. For that purpose, the pressure transducer must be positioned at the level of the heart (1/3 versus 2/3 chest diameter), opened towards the atmosphere and zeroing of the pressure performed. St Jude Aeris® wire: Lay the wire flat and flush the coil with saline solution. Then, keep wire stationary, press “connect wirelessly” on the recevier and activate the wire’s transmitter. The wire pressure sensor is zeroed automatically. Volcano Verrata® wire: Flush the wire, then connect. Zeroing of the pressure sensor then takes place automatically. When doing this, the catheter must be lying flat and not be moved. Acist Navvus® microcatheter: Flush the catheter, then connect. The wire (St Jude/Volcano) or the microcatheter (Acist) is then advanced into the coronary artery until the pressure sensor is positioned precisely at the end of the guide catheter (Figure 2). The guide catheter should be flushed at this point (due to the viscosity of contrast agent), and if necessary, disengaged from the coronay artery ostium. Pressure equalisation between the wire and aortic pressure must then be performed. This constitutes a procedural step of major importance. For the equalisation of pressures between the pressure sensor and the aortic pressure, the introducer must be removed and the haemostatic valve completely closed. A second wire, in addition to the FFR wire, could result in artefacts due to mechanical interaction, and should therefore be avoided if possible. The pressure curves must be stable and free of artefacts for several heartbeats before zeroing is performed, because the mean pressure is generally averaged over three-to-five heartbeats. “Drift” describes a slow deviation from baseline in the values measured by the pressure sensor (pressure wires/microcatheters generally have a specification of a maximum baseline drift of 7 mmHg/h); “shift” describes a sudden deviation from the baseline value, and can generally be traced back to connection problems or wire defects. The pressure sensor of the wire/microcatheter must be positioned directly distal to the lesion that is to be investigated. It should be placed in the main vessel, and not in a side branch. In case of sequential stenoses within one artery, the pessure sensor should be placed downstream of the most distal lesion (Figure 2). The tip of the wire should be carefully shaped to an appropriate curve before introducing it (generally by no more than 45°). If disconnecting the wire to advance it into the coronary artery cannot be avoided, upon reconnection, artefact-free connection must be ensured. 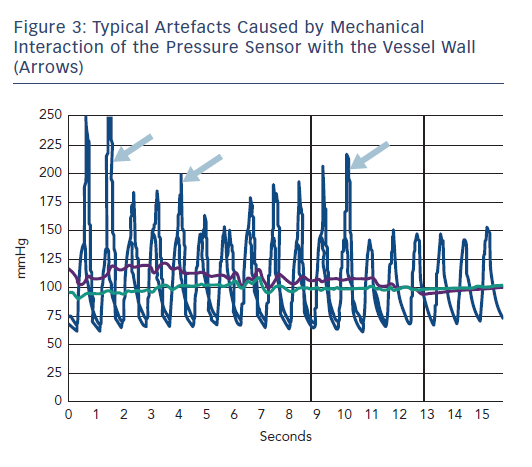 During measurement, it is important to be mindful of artefacts; the pressure sensor on the FFR wire could interact with the vessel wall, especially in cases of a small vessel caliber (Figure 3). Similarly, severely tortuous coronary segments can cause artefacts because of mechanical interaction of the pressure sensor with the vessel wall. Therefore, placement of the sensor in segments with substantial tortuosity should be avoided. It should also be noted that the presence of viscous contrast agent in the coronary artery can affect the gradient pd/pa. In the case of a resting gradient ≤0.80, haemodynamic relevance is evident, and hyperaemia is no longer required to make a clinical decision. If the FFR wire remains in the coronary vessel during an intervention, it should be ensured that the FFR wire is not “jailed” by stent implantation. Prior to advancing the pressure wire/FFR microcatheter, nitroglycerin should be adminstered (intracoronary, generally 0.2 μg), in order to prevent spasms and minimise resistance in the epicardial vessels. There are several pharmacological options and routes of administration to induce hyperaemia, as outlined below. The intravenous administration of adenosine is safe and simple, provided that contraindications are observed. Given the very short half-life of adenosine, care must be taken to ensure that the site of administration is as proximal as possible, and flow speed is sufficient, otherwise adenosine could be degraded before it reaches the coronary circulation. The standard dose for sustained maximum hyperaemia is 140 μg/kg/min. Some authors recommend that if adenosine is not administered via a central venous access, the dose should be increased (e.g. 160–180 μg/kg/min), particularly if the FFR value is in the grey zone.22 The administration of more than 180 μg/kg/min is not recommended, because this could reduce coronary perfusion. Adenosine is commercially available at various concentrations (e.g. 3 mg/ml, 5 mg/ml). 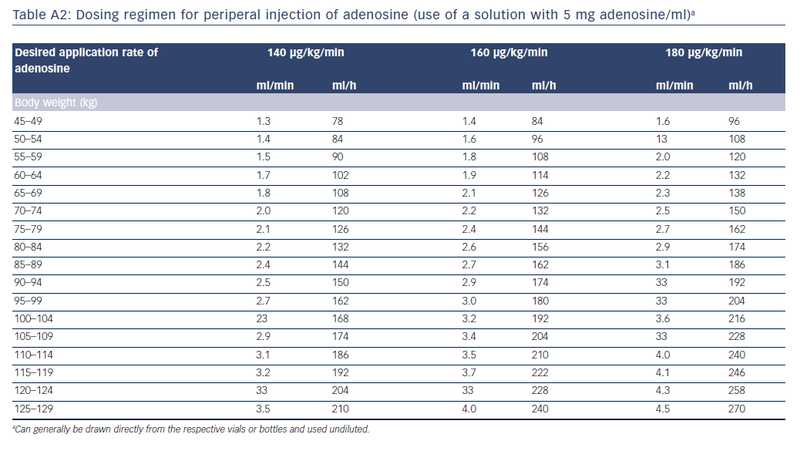 Tables A1 and A2 in the Appendix list exemplary rates of infusion depending on adenosine concentration, body weight and desired delivery rate. Regadenoson is administered intravenously at a standard dose of 400 μg, without adjustment to body weight. The time until onset of effect is approximately 37 seconds (compared to 66 seconds for intravenous adenosine.23). The maximal hyperaemic effect lasts for 30 seconds; hyperaemia fades out therafter, with a total duration of approximately 10 minutes. Overall, regadenoson appears to have fewer side-effects than adenosine and is considered to be safer in patients with chronic obstructive pulmonary disease.24 However, it has not been evaluated as thoroughly as adenosine. 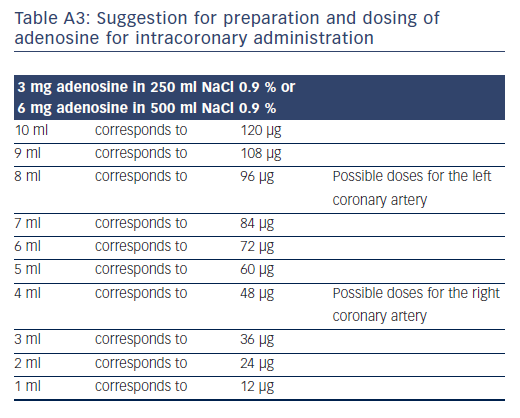 Adenosine doses for intracoronary administration vary from 40 μg to 200 μg, injected as a rapid bolus of, for example, 10 ml volume.25-27 As a general rule, lower doses should be used for the right than for the left coronary artery, as atrioventricular-block occurs more often. Doses of 80 μg for the left coronary artery and 40 μg for the right coronary artery yielded FFR results that correlated extremely closely to intravenous adenosine at 140 μg/kg/min (r=0.99).28 Table A3 in the online Appendix shows the options for creating a solution for injection dosing of intracoronary adenosine. For the peripheral administration of adenosine, ready-to-use 50 ml vials for infusion in an undiluted fashion are available. 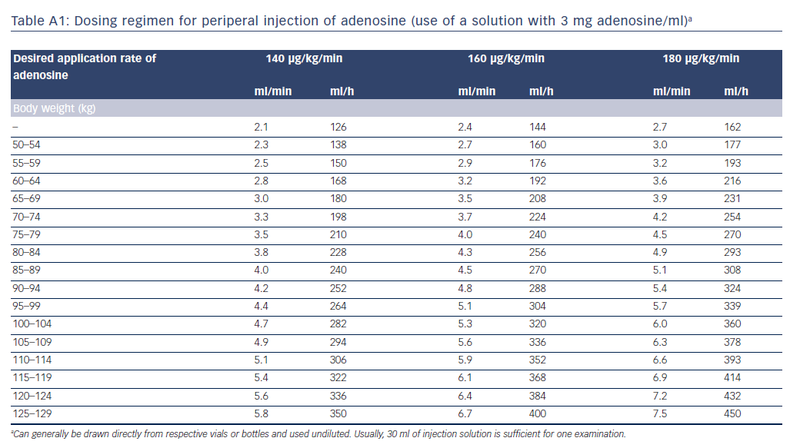 Of note, injection pumps for the peripheral administration of adenosine must permit an injection rate >200 ml/min. Often, factory settings for the maximum possible injection rate are limited to lower values, and might need to be reprogrammed by the manufacturer. Administration of a contrast agent to induce hyperaemia is currently not recommended. If coronary spasm due to the FFR wire is suspected, repeated injection of nitrates might be required. In the case of intravenous administration of the hyperaemic agent, pd/pa should be recorded until a steady state is reached, but for no less than 2 minutes. The FFR value is then the lowest ratio registered during the steady state (with the exception of artefacts that are not to be taken into account). It should be noted that the mean pd and pa often show a minimum just before reaching the constant mean pressure, but this point in time does not constitute the FFR value. In the case of intracoronary administration, pd/pa should be continuously recorded until it returns to the baseline value. The FFR value is the lowest recorded ratio (apart from artefacts). When the FFR wire/microcatheter is withdrawn after completion of the measurement, maintenance of accurate calibration should always be verified when the pressure sensor reaches the guiding catheter. This is important to identify shift or drift of pressure readings, which would lead to erroneous FFR results. If this verification indicates a relevant deviation from the baseline value of 1.00, the measurement might need to be repeated. In order to obtain correct aortic pressure tracings (pa), care must be taken to remove the wire introducer during the registration and to completely close the haemostatic valve. During FFR registration, the guide catheter must not occlude the ostium or a stenosis close to the ostium. This would cause incorrectly low pressure values to be measured, which in turn results in false high FFR values (Figure 4). Outlier pd/pa values that are caused by artefacts or arrhythmia must be carefully observed, and not be taken into account. If the patient has ectopic beats, this can cause incorrectly low pd/pa values, which must be disregarded. Values measured under AV-block/bradycardia must also be classified as “not evaluable”. If AV-block occurs during intracoronary administration (especially in the right coronary artery), the measurement might need to be repeated with intravenous administration. Ideally, FFR measurements should be archived as pressure curves or as individually-measured numeric datasets. However, the results of FFR measurements must always be evaluated taking the clinical context and clinical information into account. If the results of the FFR measurement are in conflict with non-invasive proof of ischaemia or the patient’s symptoms, decisions regarding further management must be made on an individual basis. Ultimately, an FFR value of 0.80 does not represent a single, dichotomous threshold value to be used as the sole criterion to decide in favour of or against revascularisation (Tables 2 and 3). FFR is only validated for stenoses with a degree of stenosis of at least 50 %. Lesion length is a significant predictor of a positive FFR.39,40 A pathological FFR value identifies ischaemia as a possible reason for symptoms, including vessels with long stenoses that do not appear to be relevant in the angiogram. Nevertheless, the therapeutic decision can be difficult. Careful pullback of the FFR wire/FFR microcatheter should be performed under continuous hyperaemia (or stepwise repeated measurements with intracoronary adenosine) in order to identify any localised pressure step-up. If such a pressure step-up is present, revascularisation should be considered, potentially in combination with intracoronary imaging. If no localised pressure stepup can be identified, revascularisation is generally not recommended. There are limited data on FFR measurements in stenotic bypass vessels. In a non-randomised study, FFR-guided PCI of intermediate bypass graft stenoses (visually assessed to be 40–70 %) resulted in a lower MACE rate compared to an angiographic-guided strategy.41 Stenoses of native vessels downstream of a bypass graft could be considered as native stenoses, and should be assessable by FFR. Overall, it can be assumed that, in the absence of clear impairment of microcirculation and relevant thrombus load, FFR measurements performed during immediate angiography are useful to plan further revascularisation in patients with acute coronary syndrome and multivessel coronary artery disease. Decisions about deferral of revascularisation might need to be made somewhat more cautiously for these patients compared to stable patients. In registries, FFR values after PCI correlate with the outcome.17,56 The higher the FFR value, the lower the event rate during follow up. A recent study of 574 patients with 664 lesions and FFR performed post-PCI suggested a threshold of 0.86 as the optimal predictor of MACE during follow up after PCI.57 In patients with acute coronary syndrome, that threshold might be higher (0.91 according to one study58). However, repeated FFR measurements are currently not routinely required or recommended post-PCI if the angiogram shows interventional success. If measurements are repeated, care must be taken with regard to shift and drift, and correct zeroing must be ensured. 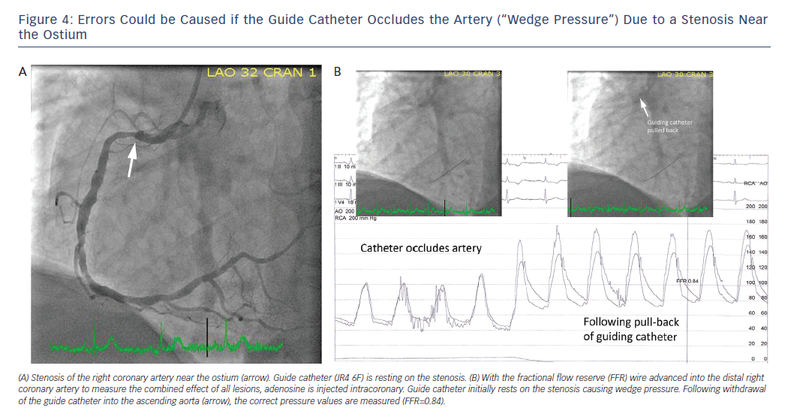 In particular, if the FFR wire was used for PCI and the pressure sensor remained distal to the lesion during the procedure, post-PCI FFR measurements must be followed by a careful pullback of the pressure sensor to the guide catheter to verify that correct calibration has been maintained. The need to use vasodilator substances to induce hyperaemia could be perceived as a limiting factor for FFR measurements and could prevent adoption in clinical routine. Two alternative pressuremeasurement methods, which are not based on hyperaemia, have been described in the literature. First, evaluation of the pd/pa ratio without hyperaemia has been suggested. Second, the so-called “instantaneous wave-free ratio” (iFR) has been proposed. It represents the pd/pa ratio not during the entire cardiac cycle, but during a specific phase within diastole when resistance in the microvasculature is lowest. All commonly-used FFR systems enable resting pd/pa values to be recorded across the entire cardiac cycle. Determination of the iFR requires a special algorithm, and is currently only possible with specific software (Volcano Harvest®). The diagnostic accuracy of iFR compared to standard FFR measurements with induced hyperaemia was 91 % in the ADenosine Vasodilator Independent Stenosis Evaluation study, which included 157 stenoses,62 80 % in a multicentre study with 392 stenoses63 and only 60 % in a multicentre study in 206 consecutive patients.64 In a large multicentre study (RESOLVE: Multicenter core laboratory comparison of the instantaneous wave-free ratio and resting Pd/Pa with fractional flow reserve), pd/pa and iFR were compared to FFR in 1,768 patients.65 It was demonstrated that 0.90 was the optimum cut-off for the iFR to identify stenoses with an FFR <0.80. For pd/pa, the optimal threshold value was 0.92. There were no significant differences between the two methods of measurement at rest, and in both cases, with these thresholds, approximately 80 % of the lesions were classified correctly compared to FFR. Two recent, large multicentre trials evaluated the use of the iFR versus FFR for clinical decision-making in a randomised fashion. The ‘SWEDEHEART’ trial randomised 2,037 patients with an indication for the invasive assessment of haemodynamic relevance of a coronary lesion to use either the iFR (threshold: 0.89) or FFR (threshold: 0.80) for decision-making.66 The mean iFR was 0.91 and the mean FFR was 0.82. In the iFR arm, 53 % of all patients underwent revascularisation compared to 56.5 % in the FFR arm (p=0.11). The primary endpoint (death from any cause, myocardial infarction or unplannd revascularisation during 12 months of follow up) was not significantly different between the groups (6.7 % versus 6.1 %, p=0.53). Using the same thresholds for decision-making, another trial randomised 2,492 patients to decision-making based on iFR or FFR.67 Again, no difference in the primary endpoint was observed at the end of the 12 month follow-up period (6.8 % versus 7.0 %), but significantly fewer baseline revascularisations were performed in the iFR group (47.5 %) compared to the FFR group (53.4 %, p=0.003). Thus, in the authors’ opinion, vasodilation can cleary be avoided in the case of resting iFR or pd/pa values that are either near 1.0 or ≤0.80. Using non-vasodilation-dependent parameters with adapted thresholds for decision-making could be a justified alternative if there were a need to avoid adenosine. The concept of diagnosing lesion-specific coronary ischaemia through FFR requires hyperaemia following maximum vasodilation of the coronary microvasculature through adenosine administration.68 Therefore, there is a possibility that in the presence of microvascular dysfunction, such as in the case of previous myocardial infarction,69 in the case of left ventricular hypertrophy or as a result of diabetic microangiopathy, the extent of achieved maximum hyperaemia will be less than in healthy individuals, meaning that the measured pd is incorrectly high, and potentially, FFR is false negative.70 In absolute terms, the changes in FFR in patients with microvascular perfusion impairment appear rather low (5 %, or in absolute values, 0.05).71 However, in the FFR borderline area (approximately 0.80), this can lead to misinterpretation of haemodynamic relevance, so that in patients with borderline FFR values and suspected impairment of microvascular function, particular care must be taken regarding the interpretation of measurement results. FFR measurements also yield incorrectly high values (and thus possibly a false-negative result) in patients with severe hypotension.72 Therefore, FFR cannot, for example, be used for revascularisation decisions in patients with cardiogenic shock. Seto et al. observed unstable (i.e. increasing) pd/pa measurements in the course of continuous intravenous adenosine administration in 22 of 68 patients.73 Under maximum hyperaemia, there was a disproportionately high increase of pd, and FFR on average increased by 0.08. In 28 % of the patients examined, this caused FFR to exceed the threshold value of 0.80. This variability means that there is a risk of false-negative FFR measurements during the long-term infusion of adenosine. While the cause of the phenomenon is unclear, it might make the assessment of multiple or serial stenoses in a coronary vessel using a pullback manoeuver during extended administration of adenosine more difficult. There are further limitations due to the fact that certain patient groups were not included or tested in the randomised FFR studies. In the FAME studies, the excluded patient groups comprised the following: patients with left main coronary artery stenosis, patients with a recent history of STEMI, patients with a history of bypass surgery, patients with impaired left ventricular (LV) systolic function (LV ejection fraction <30 %) and patients with left ventricular hypertrophy (>13 mm). For these patient groups, there are currently no randomised, controlled outcome studies to validate FFR. Even though these limitations are not widely considered in everyday practice (particularly impaired LV function and LV hypertrophy), they should be given particular attention in the case of borderline measurement results. 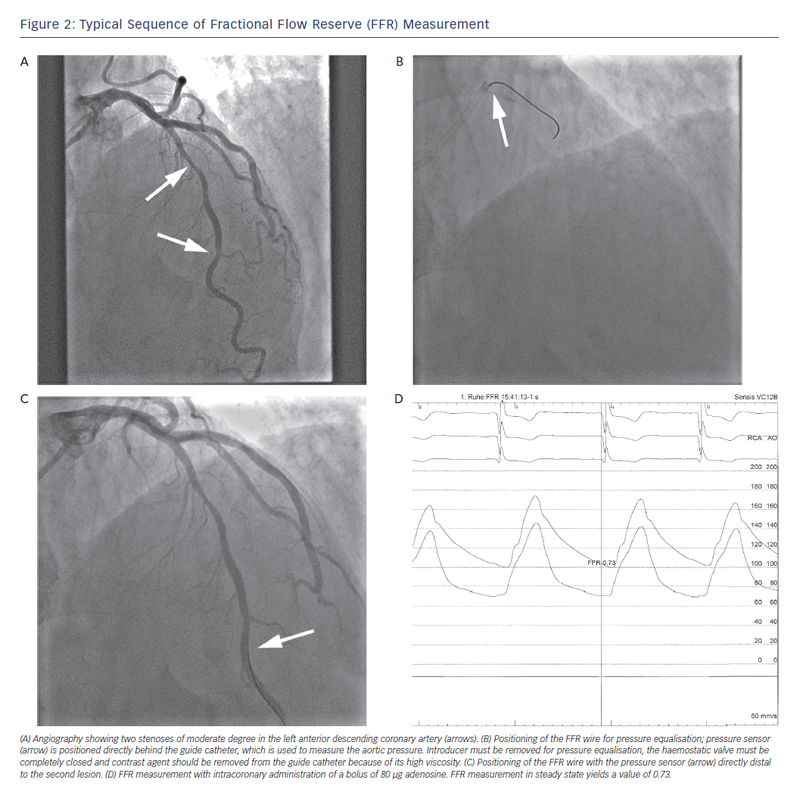 Furthermore, several methods of non-invasive FFR measurement with computational fluid dynamics are currently being evaluated; for example, based on computed tomography (CT) data,75–77 3-dimensionally reconstructed coronary angiograms78–83 and optical coherence tomography.84 However, these methods are still in the development and validation phases, and are not yet ready for clinical use. Among the methods mentioned, CT-based FFR has the most available data. 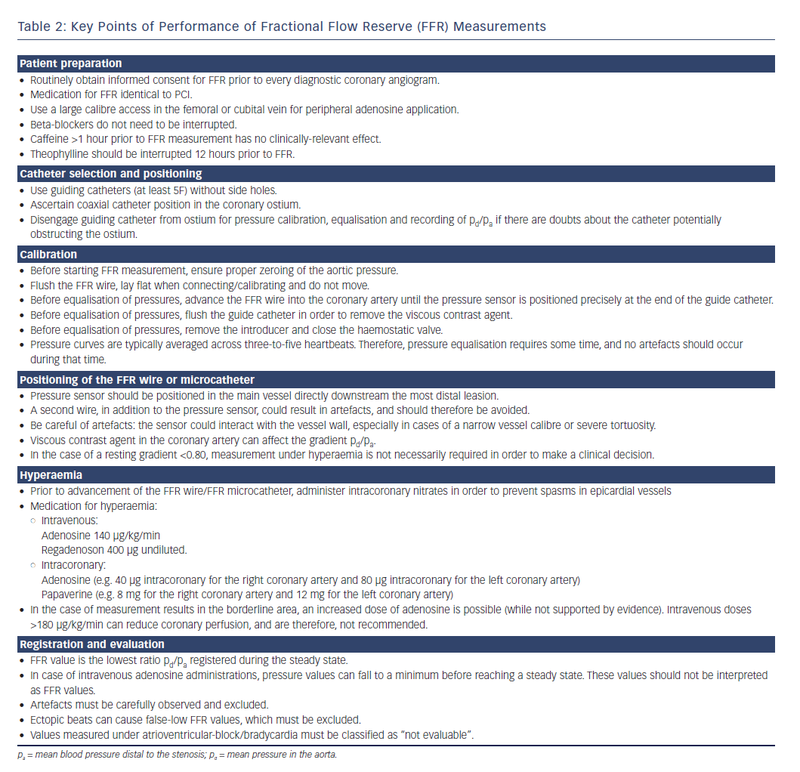 Overall, given the available data from prospective studies and the clear recommendations in all the relevant guidelines, FFR measurement should be a readily available as part of the diagnostic repertoire in all cardiac catheterisation laboratories, and physicians and support staff should be intimately familiar with the process and interpretation of FFR. Experience shows that barriers to the use of FFR are significantly reduced when all staff within a catheterisation facility are able to follow a clearly-defined routine workflow with the fewest possible number of steps to measure FFR, whether with the intravenous administration of adenosine, the intracoronary administration of adenosine or the administration of another drug. This in particular pertains to the preparation of the measuring devices and preparation of the medication to induce hyperaemia. Pijls NH, De Bruyne B, Peels K, et al. Measurement of fractional flow reserve to assess the functional severity of coronary-artery stenoses. N Engl J Med 1996;334(26):1703–8. Windecker S, Kolh P, Alfonso F, et al. 2014 ESC/EACTS Guidelines on myocardial revascularization: The Task Force on Myocardial Revascularization of the European Society of Cardiology (ESC) and the European Association for Cardio-Thoracic Surgery (EACTS). Developed with the special contribution of the European Association of Percutaneous Cardiovascular Interventions (EAPCI). Eur Heart J 2014;35(37):2541–619. Fihn SD, Blankenship JC, Alexander KP, et al. 2014 ACC/ AHA/AATS/PCNA/SCAI/STS focused update of the guideline for the diagnosis and management of patients with stable ischemic heart disease: a report of the American College of Cardiology/American Heart Association Task Force on Practice Guidelines, and the American Association for Thoracic Surgery, Preventive Cardiovascular Nurses Association, Society for Cardiovascular Angiography and Interventions, and Society of Thoracic Surgeons. Circulation 2014;130(19):1749–67. Van Belle E, Rioufol G, Pouillot C, et al. Outcome impact of coronary revascularization strategy reclassification with fractional flow reserve at time of diagnostic angiography: insights from a large French multicenter fractional flow reserve registry. Circulation 2014; 129(2):173–85. Lachance P, Déry JP, Rodés-Cabau J, et al. Impact of fractional flow reserve measurement on the clinical management of patients with coronary artery disease evaluated with noninvasive stress tests prior to cardiac catheterization. Cardiovasc Revasc Med 2008;9(4):229–34. Toth GG, Toth B, Johnson NP, et al. Revascularization decisions in patients with stable angina and intermediate lesions: results of the international survey on interventional strategy. Circ Cardiovasc Interv 2014;7(6):751–9. Bech GJ, De Bruyne B, Pijls NH, et al. Fractional flow reserve to determine the appropriateness of angioplasty in moderate coronary stenosis: a randomized trial. Circulation 2001;103(24):2928–34. Pijls NH, van Schaardenburgh P, Manoharan G, et al. Percutaneous coronary intervention of functionally nonsignificant stenosis: 5-year follow-up of the DEFER study. J Am Coll Cardiol 2007;49(21):2105–11. Zimmermann FM, Ferrara A, Johnson NP, et al. Deferral vs. performance of percutaneous coronary intervention of functionally non-significant coronary stenosis: 15-year followup of the DEFER trial. Eur Heart J 2015;36:3182–8. Pijls NH, Fearon WF, Tonino PA, et al. 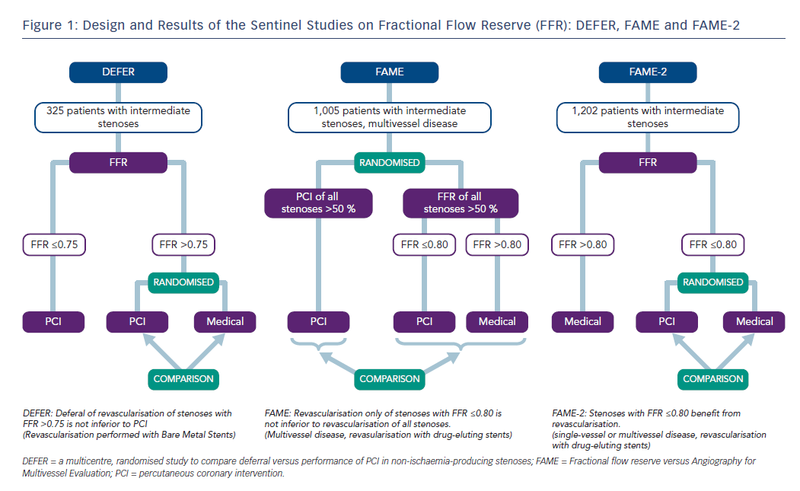 Fractional flow reserve versus angiography for guiding percutaneous coronary intervention. N Engl J Med 2009;360(3):213–24. Pijls NH, Fearon WF, Tonino PA, et al. Fractional flow reserve versus angiography for guiding percutaneous coronary intervention in patients with multivessel coronary artery disease: 2-year follow-up of the FAME (Fractional Flow Reserve Versus Angiography for Multivessel Evaluation) study. J Am Coll Cardiol 2010;56(3):177–84. van Nunen LX, Zimmermann FM, Tonino PA, et al. Fractional flow reserve versus angiography for guidance of PCI in patients with multivessel coronary artery disease (FAME): 5-year follow-up of a randomised controlled trial. Lancet 2015;386(10006):1853–60. De Bruyne B, Pijls NH, Kalesan B, et al. Fractional flow reserve-guided PCI versus medical therapy in stable coronary disease. N Engl J Med 2012;367(11):991–1001. De Bruyne D, Fearon WF, Pijls NH, et al. Fractional flow reserve-guided PCI for stable coronary artery disease. N Engl J Med 2014;371(13):1208–17. Zhang D, Lv S, Song X, et al. Fractional flow reserve versus angiography for guiding percutaneous coronary intervention: a meta-analysis. Heart 2015;101(6):455–62. Johnson NP, Tóth GG, Lai D, et al. Prognostic value of fractional flow reserve: linking physiologic severity to clinical outcomes. J Am Coll Cardiol 2014;64(16):1641–54. Adjedj J, De Bruyne B, Floré V, et al. Significance of intermediate values of fractional flow reserve in patients with coronary artery disease. Circulation 2016;133(5):502–8. Ozdemir M, Yazici GE, Turkoglu S, et al. Metoprolol does not affect myocardial fractional flow reserve in patients with intermediate coronary stenoses. Int Heart J 2007;48(4):477–83. Aqel RA, Zoghbi GJ, Trimm JR, et al. Effect of caffeine administered intravenously on intracoronary-administered adenosine-induced coronary hemodynamics in patients with coronary artery disease. Am J Cardiol 2004;93(3):343–6. Hage FG, Iskandrian AE. The effect of caffeine on adenosine myocardial perfusion imaging: time to reassess? J Nucl Cardiol 2012;19(3):415–9. Salcedo J, Kern MJ. Effects of caffeine and theophylline on coronary hyperemia induced by adenosine or dipyridamole. Catheter Cardiovasc Interv 2009;74(4):598–605. Lindstaedt M, Bojara W, Holland-Letz T, et al. Adenosineinduced maximal coronary hyperemia for myocardial fractional flow reserve measurements: comparison of administration by femoral venous versus antecubital venous access. Clin Res Cardiol 2009;98(11):717–23. Prasad A, Zareh M, Doherty R, et al. Use of regadenoson for measurement of fractional flow reserve. Catheter Cardiovasc Interv 2014;83(3):369–74. Thomas GS, Tammelin BR, Schiffman GL, et al. Safety of regadenoson, a selective adenosine A2A agonist, in patients with chronic obstructive pulmonary disease: a randomized, double-blind, placebo-controlled trial (RegCOPD trial). J Nucl Cardiol 2008;15(3):319–28. Casella G, Leibig M, Schiele TM, et al. Are high doses of intracoronary adenosine an alternative to standard intravenous adenosine for the assessment of fractional flow reserve? Am Heart J 2004;148(4):590–5. Murtagh B, Higano S, Lennon R, et al. Role of incremental doses of intracoronary adenosine for fractional flow reserve assessment. Am Heart J 2003;146(1):99–105. De Luca G, Venegoni L, Iorio S, et al. Effects of increasing doses of intracoronary adenosine on the assessment of fractional flow reserve. JACC Cardiovasc Interv 2011; 4(10):1079–84. Schlundt C, Bietau C, Klinghammer L, et al. Comparison of intracoronary versus intravenous administration of adenosine for measurement of coronary fractional flow reserve. Circ Cardiovasc Interv 2015;8(5):e001781. Wilson RF, White CW. Intracoronary papaverine: an ideal coronary vasodilator for studies of the coronary circulation in conscious humans. Circulation 1986;73(3):444–51. Wilson RF, White CW. Serious ventricular dysrhythmias after intracoronary papaverine. Am J Cardiol 1988;62(17):1301–2. Lim MJ, Kern MJ. Utility of coronary physiologic hemodynamics for bifurcation, aorto-ostial, and ostial branch stenoses to guide treatment decisions. Catheter Cardiovasc Interv 2005;65(4):461–8. Jokhi P, Curzen N. Percutaneous coronary intervention of ostial lesions. EuroIntervention 2009;5(4):511–4. Daniels DV, van’t Veer M, Pijls NH, et al. The impact of downstream coronary stenoses on fractional flow reserve assessment of intermediate left main disease. JACC Cardiovasc Interv 2012;5(10):1021–5. Mallidi J, Atreya AR, Cook J, et al. Long-term outcomes following fractional flow reserve-guided treatment of angiographically ambiguous left main coronary artery disease: a meta-analysis of prospective cohort studies. Catheter Cardiovasc Interv 2015;86(1):12–8. Fearon W, Yong A, Lenders G, et al. The impact of downstream coronary stenosis on fractional flow reserve assessment of intermediate left main coronary artery disease: human validation. J Am Coll Cardiol Intv. 2015;8(3):398–403. Kim HL, Koo BK, Nam CW, et al. Clinical and physiological outcomes of fractional flow reserve-guided percutaneous coronary intervention in patients with serial stenoses within one coronary artery. JACC Cardiovasc Interv 2012;5(10):1013–8. De Bruyne B, Pijls NH, Heyndrickx GR, et al. Pressurederived fractional flow reserve to assess serial epicardial stenoses: theoretical basis and animal validation. Circulation 2000;101(15):1840–7. Pijls NH, De Bruyne B, Bech GJ, et al. Coronary pressure measurement to assess the hemodynamic significance of serial stenoses within one coronary artery: validation in humans. Circulation 2000;102(19):2371–7. Iguchi T, Hasegawa T, Nishimura S, et al. Impact of lesion length on functional significance in intermediate coronary lesions. Clin Cardiol 2013;36(3):172–7. López-Palop R, Carrillo P, Cordero A, et al. Effect of lesion length on functional significance of intermediate long coronary lesions. Catheter Cardiovasc Interv 2013;81(4):E186–94. Di Serafino L, De Bruyne B, Mangiacapra F, et al. Long-term clinical outcome after fractional flow reserve- versus angioguided percutaneous coronary intervention in patients with intermediate stenosis of coronary artery bypass grafts. Am Heart J 2013;166(1):110–8. Cuculi F, De Maria GL, Meier P, et al. Impact of microvascular obstruction on the assessment of coronary flow reserve, index of microcirculatory resistance, and fractional flow reserve after ST-segment elevation myocardial infarction. J Am Coll Cardiol 2014;64(18):1894–904. Cuculi F, Dall’Armellina E, Manlhiot C, et al. Early change in invasive measures of microvascular function can predict myocardial recovery following PCI for ST-elevation myocardial infarction. Eur Heart J 2014;35(29):1971–80. Engstrøm T, Kelbæk H, Helqvist S, et al. Complete revascularisation versus treatment of the culprit lesion only in patients with ST-segment elevation myocardial infarction and multivessel disease (DANAMI-3—PRIMULTI): an open-label, randomised controlled trial. Lancet 2015;386(9994):665–71. Layland J, Carrick D, McEntegart M, et al. Vasodilatory capacity of the coronary microcirculation is preserved in selected patients with non-ST-segment-elevation myocardial infarction. Circ Cardiovasc Interv 2013;6(3):231–6. Ntalianis A, Sels JW, Davidavicius G, et al. Fractional flow reserve for the assessment of nonculprit coronary artery stenoses in patients with acute myocardial infarction. JACC Cardiovasc Interv 2010;3(12):1274–81. Layland J, Rauhalammi S, Watkins S, et al. Assessment of fractional flow reserve in patients with recent non-stsegment- elevation myocardial infarction: comparative study with 3-t stress perfusion cardiac magnetic resonance imaging. Circ Cardiovasc Interv 2015;8(8):e002207. Leesar MA, Abdul-Baki T, Akkus NI, et al. Use of fractional flow reserve versus stress perfusion scintigraphy after unstable angina. Effect on duration of hospitalization, cost, procedural characteristics, and clinical outcome. J Am Coll Cardiol 2003;41(7):1115–21. Sels JW, Tonino PA, Siebert U, et al. Fractional flow reserve in unstable angina and non-ST-segment elevation myocardial infarction: experience from the FAME (Fractional flow reserve versus Angiography for Multivessel Evaluation) study. JACC Cardiovasc Interv 2011;4(11):1183–9. Layland J, Oldroyd KG, Curzen N, et al. Fractional flow reserve vs. angiography in guiding management to optimize outcomes in non-ST-segment elevation myocardial infarction: the British Heart Foundation FAMOUS-NSTEMI randomized trial. Eur Heart J 2015;36(2):100–11. Lopez-Palop R, Carrillo P, Torres F, et al. Results of fractional flow reserve measurement to evaluate nonculprit coronary artery stenoses in patients with acute coronary syndrome. Rev Esp Cardiol (Engl Ed) 2012;65(2):164–70. Hakeem A, Edupuganti MM, Almomani A, et al. Long-term prognosis of deferred acute coronary syndrome lesions based on nonischemic fractional flow reserve. J Am Coll Cardiol 2016;68:1181–9. Singh IM, Subbarao RA, Sadanandan S. Limitation of fractional flow reserve in evaluating coronary artery myocardial bridge. J Invasive Cardiol 2008;20(5):E161–6. Gould KL, Johnson NP. Myocardial bridges: lessons in clinical coronary pathophysiology. JACC Cardiovasc Imaging 2015;8(6): 705–9. A Lee MS, Chen CH. Myocardial bridging: an up-to-date review. J Invasive Cardiol 2015;27(11):521–8. Pijls NH, Klauss V, Siebert U, et al. Coronary pressure measurement after stenting predicts adverse events at follow-up: a multicenter registry. Circulation 2002;105(25): 2950–4. Agarwal SK, Kasula S, Hacioglu Y, et al. Utilizing postintervention fractional flow reserve to optimize acute results and the relationship to long-term outcomes. JACC Cardiovasc Interv 2016;9(10):1022–31. Kasula S, Agarwal SK, Hacioglu Y, et al. Clinical and prognostic value of poststenting fractional flow reserve in acute coronary syndromes. Heart 2016;102(24):1988–94. Chen S-L, Ye F, Zhang J-L, et al. Randomized comparison of FFR-guided and angiography-guided provisional stenting of true coronary bifurcation lesions: the DKCRUSH-VI trial (Double Kissing Crush Versus Provisional Stenting Technique for Treatment of Coronary Bifurcation Lesions VI). JACC Cardiovasc Interv 2015;8(4):536–46. Tu S, Echavarria-Pinto M, von Birgelen C, et al. Fractional flow reserve and coronary bifurcation anatomy: a novel quantitative model to assess and report the stenosis severity of bifurcation lesions. JACC Cardiovasc Interv 2015; 8(4):564–74. Koo BK, Park KW, Kang HJ, et al. Physiological evaluation of the provisional side-branch intervention strategy for bifurcation lesions using fractional flow reserve. Eur Heart J 2008;29(6):726–32. Sen S, Escaned J, Malik IS, et al. Development and validation of a new adenosine-independent index of stenosis severity from coronary wave-intensity analysis: results of the ADVISE (ADenosine Vasodilator Independent Stenosis Evaluation) study. J Am Coll Cardiol 2012;59(15):1392–402. Petraco R, Al-Lamee R, Gotberg M, et al. Real-time use of instantaneous wave-free ratio: results of the ADVISE in-practice: an international, multicenter evaluation of instantaneous wave-free ratio in clinical practice. Am Heart J 2014;168(5):739–48. Berry C, van ‘t Veer M, Witt N, et al. VERIFY (VERification of Instantaneous Wave-Free Ratio and Fractional Flow Reserve for the Assessment of Coronary Artery Stenosis Severity in EverydaY Practice): a multicenter study in consecutive patients. J Am Coll Cardiol 2013;61(13):1421–7. Jeremias A, Maehara A, Généreux P, et al. Multicenter core laboratory comparison of the instantaneous wave-free ratio and resting Pd/Pa with fractional flow reserve: the RESOLVE study. J Am Coll Cardiol 2014;63(13):1253–61. Götberg M, Christiansen EH, Gudmundsdottir IJ, et al. Instantaneous wave-free ratio versus fractional flow reserve to guide PCI. N Engl J Med 2017;376(19):1813–23. Davies JE, Sen S, Dehbi HM, et al. Use of the instantaneous wave-free ratio or fractional flow reserve in PCI. N Engl J Med 2017;376(19):1824–34. van de Hoef TP, Siebes M, Spaan JA, Piek JJ. Fundamentals in clinical coronary physiology: why coronary flow is more important than coronary pressure. Eur Heart J 2015;36(47): 3312–9a. McClish JC, Ragosta M, Powers ER, et al. Effect of acute myocardial infarction on the utility of fractional flow reserve for the physiologic assessment of the severity of coronary artery narrowing. Am J Cardiol 2004;93(9):1102–6. Pijls NH, Kern MJ, Yock PG, De Bruyne B. Practice and potential pitfalls of coronary pressure measurement. Catheter Cardiovasc Interv 2000;49(1):1–16. Claeys MJ, Bosmans JM, Hendrix J, Vrints CJ. Reliability of fractional flow reserve measurements in patients with associated microvascular dysfunction: importance of flow on translesional pressure gradient. Catheter Cardiovasc Interv 2001;54(4):427–34. Verdier-Watts F, Rioufol G, Mewton N, et al. Influence of arterial hypotension on fractional flow reserve measurements. EuroIntervention 2015;11(4):416–20. Seto AH, Tehrani DM, Bharmal MI, Kern MJ. Variations of coronary hemodynamic responses to intravenous adenosine infusion: implications for fractional flow reserve measurements. Catheter Cardiovasc Interv 2014;84(3):416–25. Berry C, Corcoran D, Hennigan B, et al. Fractional flow reserve-guided management in stable coronary disease and acute myocardial infarction: recent developments. Eur Heart J 2015;36(45):3155–64. Min JK, Leipsic J, Pencina MJ, et al. Diagnostic accuracy of fractional flow reserve from anatomic CT angiography. JAMA 2012;308(12):1237–45. Norgaard BL, Leipsic J, Gaur S, et al. Diagnostic performance of noninvasive fractional flow reserve derived from coronary computed tomography angiography in suspected coronary artery disease: the NXT trial (Analysis of Coronary Blood Flow Using CT Angiography: Next Steps). J Am Coll Cardiol 2014;63(12):1145–55. Gaur S, Bezerra HG, Lassen JF, et al. Fractional flow reserve derived from coronary CT angiography: variation of repeated analyses. J Cardiovasc Comput Tomogr 2014;8(4):307–14. Morris PD, van de Vosse FN, Lawford PV, et al. “Virtual” (computed) fractional flow reserve: current challenges and limitations. JACC Cardiovasc Interv 2015;8(8):1009–17. Morris PD, Ryan D, Morton AC, et al. Virtual fractional flow reserve from coronary angiography: modeling the significance of coronary lesions: results from the VIRTU-1 (VIRTUal Fractional Flow Reserve From Coronary Angiography) study. JACC Cardiovasc Interv 2013;6(2):149–57. Papafaklis MI, Muramatsu T, Ishibashi Y, et al. Fast virtual functional assessment of intermediate coronary lesions using routine angiographic data and blood flow simulation in humans: comparison with pressure wire – fractional flow reserve. EuroIntervention 2014;10(5):574–83. Tu S, Barbato E, Köszegi Z, et al. Fractional flow reserve calculation from 3-dimensional quantitative coronary angiography and TIMI frame count: a fast computer model to quantify the functional significance of moderately obstructed coronary arteries. JACC Cardiovasc Interv 2014;7(7):768–77. Tröbs M, Achenbach S, Röther J, et al. Comparison of fractional flow reserve based on computational fluid dynamics modeling using coronary angiographic vessel morphology versus invasively measured fractional flow reserve. Am J Cardiol 2016;117:29–35. Tu S, Westra J, Yang J, et al. Diagnostic accuracy of fast computational approaches to derive fractional flow reserve from diagnostic coronary angiography: the international multicenter FAVOR pilot study. JACC Cardiovasc Interv 2016;9(19):2024–35.